Man tased by police in now-infamous video still has no plans to adhere to distancing order. Boaz Albert, whose recent violent arrest by police made national headlines, has declared that despite what he went through, he still has no intention of abiding by an administrative distancing order keeping him from his home. Administrative orders allow security forces to detain suspects, or to make it illegal for them to enter certain areas, without trial. 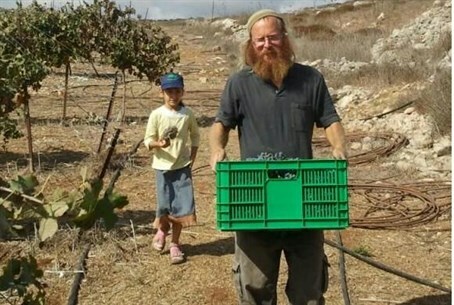 Albert, a farmer from Yitzhar and a married father of several young children, has received orders forbidding him to enter his hometown on multiple occasions. Nearly two weeks ago Albert was arrested after returning to his home in Yitzhar despite the latest distancing order. The arresting officers repeatedly used a taser gun on him as he yelled in pain. Yizchak Shadmi, head of the Binyamin Residents’ Council, told Arutz Sheva that Albert’s struggle is a very important once. “Boaz is right, and he is also brave. The time has come to debate these administrative orders. It’s outrageous that whenever the Shin Bet is afraid of someone, it asks the commanding general to sign a distancing order,” he said. “The orders are issued without trial, without any possibility of mounting a defense. They constitute a severe form of punishment, they cut a person off from his home, his children and his livelihood,” he continued. “They wouldn’t dare to do something like that to Arabs without bringing evidence and presenting it to a judge,” he accused. Shadmi clarified that he is not against the Shin Bet. “The Shin Bet of course does sacred work in the war against our enemies. But here we’re talking about people who were in the army, who do reserves duty, who contribute to society. They might be dangerous people – but a judge must see the evidence,” he said.